Texas is known for quite a few things: its sheer size, the Alamo (who could forget? ), “The Yellow Rose of Texas,” its bustling artistic scene . . .
You might enjoy basking in the hot summer sun when there’s nothing to do but lounge around and do nothing at all, but you probably don’t like to take the heat from that sun inside with you. That’s why you do what you can to keep your home cool. And one of the best installations you can have in your home for that purpose is a ceiling fan! Paddling quietly but constantly, a ceiling fan can circulate the cool air in a room, helping to make your home and you that much more comfortable when the intense Texas heat is raging outside! Of course, like anything, your ceiling fans can suffer from damages. This damage can be a freak accident, or it can be general age and wear. Whatever the case may be, at some point, you could find yourself with a broken fan -- and a less comfortable living situation! 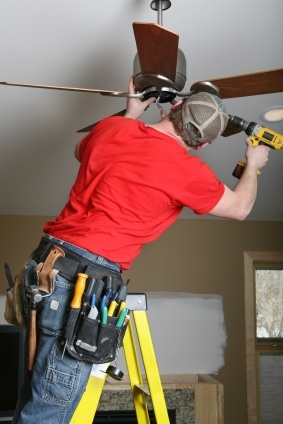 Here at John Jones Electric, we don’t work on ceiling fans only when you are experiencing troubles with them. We can also work to provide you with MORE fans as you might need them. Whether you are renovating your home or perhaps adding an addition -- or even simply replacing an old ceiling fan with a newer model -- you can rely on your local San Antonio electricians at John Jones Electric to provide you with a reliable ceiling fan thanks to our installation service! Texas can get pretty hot, and you need to beat the heat in whatever way you’re able to. And with quality ceiling fan work provided by your local electricians at John Jones Electric, you can be sure to beat even the most intense heat!